Villa Giulia is surrounded by a beautiful and spacious garden with an airy terrace where to dine and relax in front of a stunning view of the lake. The property includes a large parking space (3 cars and one motorbike), from which it is possible to access the private beach. The villa is divided as follows, the first floor comprises a kitchen with the garden view, bathroom, 2 bedrooms (one double bed plus if required single bed) and the other with two single beds), bright dining room and spacious sitting room both with lake view, and a cosy terrace with a barbeque. On the second floor: 2 bedrooms (one double bed and one single bed) and bathroom. In the property is available a WiFi internet connection. Both the bathrooms include hand/shower/face towels. La vacanza trascorsa a Villa Giulia è stata veramente sorprendente. Le fotografie non rendono giustizia a questa bellissima villa affacciata sul lago, appena ristrutturata e veramente confortevole. La pulizia dell'immobile e il servizio della proprietaria sono stati eccellenti. Consiglio a tutti coloro che cercano un rifugio di pace e privacy totale. We stayed here in this lovely villa for our late summer vacation. The villa is amazing, it is spacious, airy and bright. It had been recently renovated so the interior is fresh, new and clean. We enjoyed our dinner on the terrace with the BBQ and we had a super holiday, swimming in the lake from our private beach! The host, Giulia was very friendly and was very helpful! We recommend this property if you are looking to spend an easy but fantastic holiday at the lake. We stayed at this lovely house during August with our friends (6 adults). We were speechless when we arrived and realized that the place looks even more amazing than what we saw in the photos. They had a recent renovation and the interior is fresh. The lake view is amazing especially early in the morning. Every corner of the house got a special attention in design and comfort. We really enjoyed the private beach and the fact that we only had to cross the street to get there. The noise of the street was a worry, but after you get used to it you will not notice it anymore. You will truly live a dream once you step into this amazing home. THANK YOU! We will come again! The property was pretty, clean, cozy and well located for visiting Arona, and local attractions. Its a lovely place for cozy movie watching and board game playing and has a large kitchen and good dining space for cooking. The kids enjoyed the beach very much. We were a bit concerned for crossing the street, but it looks worse then it is. With the children we just waited the right moment to cross and nothing dangerous. We thoroughly recommend the villa! In July my wife and I, together with our teenage boys, spent 3 weeks in Villa Giulia. The very comfortable villa contributed a great deal to our fantastic holiday. The house is built against the slope of the hills surrounding the lake. From the street that follows the borders of the lake you have to climb a few stairs to get to the entrance and the “ground” floor (which is some five meters above the road). The living room and the bedrooms on the ground floor are spacious, with high ceilings that contibute to the cool temperature in the house. The bedrooms on the top floor are fine as well. Two bathrooms are a luxury, and the piece-de-resistance is the large terrace with a magnificent view over the southern part of the lake. Together with the private beach this is a splendid place to be. The house is built in typical Italian style but inside it is modern and has al the luxury we appreciate during our holiday. The owners are very friendly, speak fluent English and German, and made us feel right at home. They even made an extra 200 kilometers trip to see if everything was OK, and advised us on great wines and restaurants. Arona is a great starting point to discover the beautiful Lago Maggiore region. We made trips to Milan and San Siro, the Mottarone, the markets in Luino and Cannobio, Lago d’Orta etc. Beforehand we were a bit worried about noise from the railroad track that runs behind/above the house, but that proved to be no problem. Most trains are very quiet, and you quickly get used to them, so much that after a day we didn’t notice them anymore. My wife, who is normally a light sleeper slept like a log for three weeks. And the tenant before us who counted the number of cars on the road must have done so on a busy Saturday. The rest of the week the traffic on the road is normal and quiet. If you look for the peace and quiet of waving trees in a forest than this is not for you. But for everybody else this is a great place for your holidays. We enjoyed it very, very much. Abbiamo alloggiato alla villa per due settimane in giugno e tutto era meglio di quel che ci si aspettava. I padroni di casa sono una coppia amichevole e disponibilissima. La vicinanza della strada non ci ha comportato nessun problema di rumore, la villa è sicura e confortevole. Abbiamo usufruito della disponibilità della spiaggia privata e raccomandiamo la villa a chiunque abbia bisogno di relax e comodità. 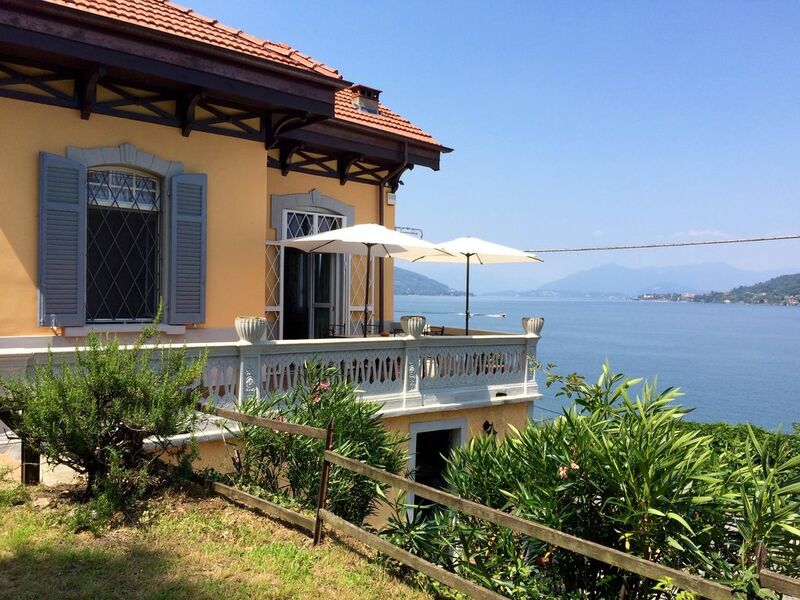 Villa Giulia is located on Lake Maggiore just outside Arona, which is 1,5km away. The location is surrounded by numerous sightseeing positioned nearby: the lively town of Arona, Punta di Lido, San Carlo Borromeo statue, the lakeside, art museum Villa Ponti, and different churches. The nearby towns are Meina, Stresa, Lesa and the small town of Angera just in front of Arona, reachable by small boats. The vibrant cities of Milan and Turin are just one hour away by car. Pagamenti. La tariffa include le facilities (pulizie, gas, luce, tasse). Per fermare la prenotazione si richiede un deposito che varia dal totale richiesto. Un deposito danni restituibile di 250 € verrà richiesto a prenotazione che sarà restituito entro 15 giorni dalla data di partenza. Le lenzuola e asciugamani hanno un costo aggiuntivo di 150€.